Notes: To sum up, de-makes are the inverse of the "next-gen" game update. Take a new game, and roll it back to an older piece of hardware. Only we're going to be rolling it WAY back; all the way to the original Game Boy! Goldeneye 2D is a perfect example, and the inspiration for this theme! To help you get started, I've included a few choice screens from the better-looking GB games of the past. Feel free to use any of the palettes in these images, or invent your own 4 color monochrome ramp! Is this your first Mockup Frenzy? Why not check out the rules & results from Mockup Frenzy #1: Mobility! and Mockup Frenzy #2: Ninjas! HOLY CRAP. 47 ENTRIES! YOU GUYS ARE AWESOME! Re: Mockup Frenzy #3: Game Boy De-Makes! Hey Adam, could you clarify for me the Gameboy restrictions? It's a little bit complicated/confusing for me to understand, specifically the whole character sprites being on the same raster or what have you. Examples would probably work best, like just describe for me a no-no situation. I wanna try and stick to the strict rules. Give myself a real challenge, so the sooner you help me out the better! Lemme know if that makes more sense! Background tile palette: every background tile can use any of the 4 colors. Background tile priority: each tile has a 0 or 1 that determines whether or not it is drawn in front of or behind the sprites. This doesn't matter a TON for mockups either, but still interesting! However, I believe it works across whole tiles; so you couldn't have half a tile covering up part of a sprite, or something, because tiles don't have transparency. Sprite palettes: this one is pretty weird, even I admit that, but it does actually make sense. Since the GB only has 4 colors, and sprites need at least 1 color slot for transparency, the GB lets you use up to 2 different palettes for your sprites, each (one would assume) indicating a different color for transparency. E.g. palette one might mark black as the transparent color, for bright sprites on a dark background, while palette two might have white as trans, which would be good for making dark sprites over a light background. If you look at each of the screenshots above you'll see that nearly all of their sprite palettes drop one or the other of the grays, to keep sprite contrast high. Lemme know if you have any more questions! Can character sprites be composed of more than one actual sprite? because those ones look bigger than 8x16 OR 8x8, so I'm assuming you can stack sprites to make a bigger hero/ enemy, as long as no more than 10 of them overlap? Am I getting that right? Anyways, I think I'll try my best to stick to restrictions, but if i mess up, oh well, this is my first time working in only 4 colours. Expect an actual screenie soon! Yes absolutely. Very common practice for what we perceive to be 1 sprite to be made up of anywhere from 2 to 8 sprites, lots of NES games did this too! So are these raster lines horizontal, vertical, or both? I assume unlimited tiles and sprites for these, I would of course optimize if I were to actually put this on a Gameboy. 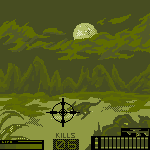 I used my own radioactive spinach palette which I eyeballed from pictures of an actual Gameboy. And the gauntlet, my friends, has been thrown.